Basically, just to describe my needs: I wanted a product with a hard drive to save all my movies on; be it ripped DVDs, downloaded movies or any other kind. The idea was to completely move the computer out of the equation, so anyone in the family (basically, the people aren’t tech freaks like me) could use it just by using a remote. Option to stream video to it from the computer. Only supports iTunes for transfers. Only supports movies in two formats, H.264 and MPEG-4, which basically means items bought from the iTunes store, or converting your existing movies. My take on it is that the hard drive is completely insufficient; 40 GB is almost nothing, less than some iPods, for Pete’s sake. Streaming is not an option for me, because in that case I’d rather just put my MacBook Pro next to the TV instead; the idea was to become independent from the computer. And, being limited to iTunes for transferring is not a desirable situation. But, the biggest flaw of them all, a giant one, is the lack of supported video formats. Also, in many countries in Europe where it’s released, you can’t even buy movies from the local iTunes store. When it comes to getting around the ridiculous limitations that Apple have built-in, to learn more you can go to Apple TV Hacks and How-To: play DivX and Xvid on your Apple TV. But, to me, I’m not interested in paying for a product which so many drawbacks and limitations, and is far from ready for the prime time market. Verdict: Just like Front Row, Apple TV looks great and is completely useless. Shame on you, Apple. For about the same price (around $299), a couple of months ago I bought a TViX HD M-4000P, which has meet all of my needs. Almost no video format limitation at all. Supports wmv9, WMV, HD, .avi, .mpg, .vob, .asf, .tp, .tr, IFO, ISO. Codecs: MPEG 1 / 2, XVID. Subtitle support: smi,sub,srt,aqt,utf,lrc / Image Subtitle : sub (with idx). File transfers just any way you like, exactly as with any external drive. Can act as a FTP server. You can insert any hard drive you want to, and also connect external hard drives through USB. And that’s pretty much all I want. It is definitely not as good looking as the Apple TV, but instead it has a real remote, and, at the top of it all: It. Just. Works. The only two downsides is that it doesn’t support wireless connections, so you need to connect to it via a USB cable, and that it can be just a little bit too noisy. However, with five different fan speed settings available, they are most likely to satisfy your needs (with two small children at home, I can’t have the volume too loud, so maybe that’s why I can hear the TViX at all; a friend who has the same model says he can’t her his’ when watching something). Tip for Mac users: Use the Disk Utility to format the hard drive you use to the MS-DOS File System. This is necessary for the TViX to work and for you to be able to read and write files. My recommendation is that if you look for his kind of product, TViX is definitely the way to go, since it won’t hold you back in anyway. There are also a number of different models available, so just see which one is the right for you! I was looking at the same kind of thing a while back but I settled for a different solution. A DVD player which also supports the same video formats you mentioned. I just burn the TV shows/Movies/etc onto the DVD as data files and I'm ready to go. I know its not quite as handy but I don't have to worry about running out of space or syncing the media player and my computer. Also the DVD's serve as handy backups incase my computer hard-drive dies. Aaron Bassett's comment prompts one question: is there a device out there that does both? A big, replaceable, HD, a way to connect to it via ethernet or USB, as well as a DVD player. And let's not forget it should be updatable with any codec possible. PS: You should not allow strike if your page has a strict doctype. is this page invalid now? 1) a cheap computer with plenty disks space in it running WinXP, WizD, FTP server, WAMP, etc. Connected it all using wired networking, and now the "library" of movies/music is accessible in both livingroom and bedroom. Cool part is that the Avellink Player plays pretty much any format, is compatible with WizD/Nero/etc, can play DVD's and CD's (regular or with AVI's/MP3's). TVIX Box Update: As the poster says, there are several different models available, and recently the TVIX Box M-4100SH has been added for higher performance and better HD support (H.264 decoding, HDMI output and 1080P resolution). 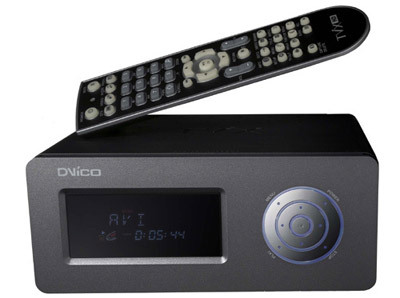 The model in this post (M-4000PA) now features optional wireless LAN and optional HDTV digital tuner and HDD recorder. Regarding the questions about DVD integration – the TVIX Box line can store and/or play ripped CD's and DVD's. In addition, if you plug in an external USB DVD drive it can play supported files and unencrypted DVD's off the DVD drive – however, it CANNOT play encrypted DVD's this way. If you are connected to your network via the built-in LAN or optional wireless, you can even stream SHOUTcast Internet radio direct from the web, and of course virtually every type of media from your PC, digital camera, camcorder, or external USB storage devices. I personally bought a KiSS Technology DVD player a while back, which then supported streaming from a PC using Ethernet, listening to Shoutcast radiostations over the internet and playback of lots of file formats. They are now owned by Linksys and some of the models are now HD compatible, have internal hard drives (although I can't find how big they are), use a wireless network connection and support even more formats. And firmware updates keep it up-to-date. I'm thoroughly satisfied with it. Personally, I just can't stand the hassle of burning DVDs all the time, and I regard the hard drive of the TViX as my backup. I don't know of any hard disk player that does but, but I guess it's bound to exist. TViX is updateable through firmware updates, for new codecs and other things. Regarding <code>strike</code>: Well, you're absolutely right. Thing is, the default WordPress supports it either way, and to me it's such a small deal so I haven't looked into preventing it. Interesting input, thanks! I'm not sure about the sizes, and ripped DVDs work fine for me (although I haven't double-checked the size of the files). Absolutely, I guess a cheap computer is the other viable option. Good to hear! Now that you mention, I've heard others who are also satisified with their KISS players. I've been using a soft-modded Xbox (they go for 70 euro nowadays) with Xbox Media Center for 1.5 year now. Hands down the best piece of software I have ever used in my life. Only downside is that the Xbox's hardware is too old to run native 720p content. Then again, I never download native 720p content. I recently bought the Tvix 6500 HD box and i must say it is absolutely amazing. I was for a while thinking about getting the apple TV box an i was on the verge of getting it but then i started to look at the file formats it supported, how big the disk inside of it was and what i could do with it, was it versatile? I looked at iTunes store to have a look if you could buy movies of the webshop, seeing as i live in Norway i could not do that yet, and still cant. File formats, it only supported its own formats, apple formats, so that means you have to convert the movies you have from DVDs. If you want to have good quality movies it will take a great deal of time to convert them, and seeing as that the higher quality you want to have the more disk space it takes. In essence the apple TV is limiting your flexibility and makes it quite a hassle. So much so that its not even worth it, you might just aswell use the time it takes to convert movies, transfer them to the box, hook it up look at the eye-candy interface more productive, like for instance… open the dvd cover, put the dvd in the player and … well… play it :)) … which ofc. puts you right back at square one and a couple bucks shorter. And look at the disk space you get, its pathetic! 40 and 160. Its just a joke! To be honest i think the people that buy this thing dont have a clue really, i mean… its nice looking, front row is eye candy but thats it! Its completely useless if you look at it from the perspective of actually having something that really works the way you want it to work. Now back to the Tvix 6500. Sure.. it has its bugs now but they are paying attention and working on the firmware and thus upgrading the thing and making it more stable. Im now in my first firmware upgrade since i bought it. This thing is a beast! I put in a 500 Gb disc in it and i have all my fav. DVDs in .iso format on it. Some divx files, some xvid files, some .mkv files and more coming in as time goes by. I bought some blu-ray movies and extracted the movies only and made them into .mkv movies. Works perfect. Sure it stumbles at times when you ffw and rew the .mkv files but so does my PC. .iso files (dvd copies) works like a charm. No problems what so ever so far. This thing is the best thing since sliced bread :p … and you know what? It works the way you want it to.